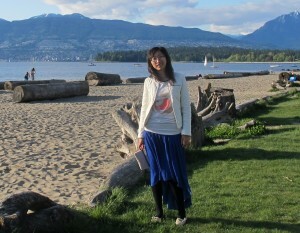 Qian "Peggy" Pan, a new ILC communicator for Asia. These days of late summer and early autumn are the best season of the year in Beijing! The sun is shining high over the blue sky, and green leaves that are reflected through the sunshine dance to the tune of the cool winds. As we wave goodbye to the hot August, we are starting to embrace a warm and comfortable season! After an exciting and interesting summer holiday, students are packing their books and getting ready for the new semester. For me, a new ILC communicator for Asia, I am learning from, sharing and connecting with the ILC communicators. My name is Qian Pan, but all my non-Chinese colleagues call me Peggy, and I started working at the Institute of High Energy Physics of the Chinese Academy of Sciences (IHEP) in 2009, after graduating from Beijing Language and Culture University. My undergraduate major is English, and the orientation of my post-graduate study is about foreign linguistics and its application. Before I acquired the master of arts degree, I had one year of internship in the Beijing Organizing Committee of Olympic Games (BOCOG) from 2007 to 2008. In BOCOG, I worked in the Media Operation department, which aimed to offer the best services to media from all around the world and helped them deliver a newsworthy story during the time of the games. At present I work in the Foreign Affairs Department of IHEP, and my job mainly concerns foreign visit affairs, international conferences held at our institute and IHEP’s English website. Therefore I am used to communicating frequently with foreign physicists and writing IHEP news coverage. Since IHEP is a member of Interaction Collaboration, in March I joined the annual spring meeting of the Interaction collaboration in Vancouver and met two of the other ILC communicators, Leah Hesla (Fermilab) and Rika Takahashi (KEK). That was when I got to know ILC communications. This June, Jie Gao, professor at IHEP, came to me and invited me to join the communicators’ team. I was very excited at this opportunity to work with an international team. I had confidence that my language and media-related working experience would help me to do a good job in ILC communication. With this new position, I will put more focus on China’s involvement in the International Linear Collider project. As an ILC communicator, I will write stories for ILC NewsLine and take care of general communication business at the regional and global level, making sure that colleagues, decision makers and eventually the public will be well aware of the exciting studies and results in the ILC community. During the past two months, especially after the discovery of Higgs-like particle on 4 July, I gradually realised how huge and significant the project is that I am involved in. In this team I saw their rigourous attitude to every piece of news writing, and I saw their passion to promote the ILC project to people all around the world. Working together with Rika, Perrine Royole-Degieux (CNRS/IN2P3) and Barbara Warmbein (DESY), I believe we will make our own contribution to this international project in the future. Dear Dr.Shin-ichi, thank you, and I feel very excited to join the ILC project and be a part of it. Look forward to meeting you in Beijing. Thank you for your constant support on ILC Asia activities, and see you at IHEP soon.